After the end of the war in 1918, Britain began the long process of commemorating the service of those who had lost their lives during its course. As part of this, the government issued to their next-of-kin (in addition to any of the standard campaign medals an individual might have been entitled to had they lived) what was known as the Memorial Plaque and the Memorial Scroll. The former was a bronze disc, about 5 inches in diameter, and depicted Britannia holding a trident whilst standing with a lion, holding an oak wreath above a rectangular tablet bearing the deceased's name cast in raised letters. Rank and regiment was not included, since there was to be no distinction between sacrifices made by different individuals. However, this was complimented by the Memorial Scroll, which did provide additional information as to rank, branch of service or any decorations awarded. The scroll itself was a little smaller than a modern A4 sheet of paper, printed on thick card, and came in three main varieties. Those to the Army had a large blue H in the main text, with the rank/name/regiment hand-written at the bottom in red ink. Those to the Navy had a large red H, with the hand-written naming at the bottom in blue ink. Finally, those to the RAF had a large black H in the main text, with the hand-written naming at the bottom in both red and blue ink. Often displayed as treasured momentoes of a lost life by a mans next-of-kin, whilst the medals and plaque tend to survive intact the scroll itself has usually succombed to the combined ravages of time, insect damage, and exposure to either light or damp over the course of nearly a century. Those that do survive might be too fragile or precious to place safely on normal view, thus I offer for sale a new made replica that can replace a missing original entirely, or stand in an originals place for ordinary display purposes without fear of the original being damaged further. These replicas are not the cheap A4 copies printed on white paper some sellers offer for sale on Ebay or similar sites. These are produced from high quality scans of an original in my posession, printed on high quality card that closely matches that which the originals were made of, and then cut to the correct size. Whilst not hand named they are named using a computer font which is a close match for that used on most scrolls. If you wish to purchase one of my replica scrolls, simply send me the relevant casualty details from the CWGC website and I will print an appropriately named scroll of the correct pattern to match. Where possible I try my best to ensure the format the naming takes is as close to that the original would have taken, however if required this can be altered or changed entirely to represent different wants or needs. Each scroll costs £9.00, plus postage and packaging. Please see the individual pages for the Army, Navy and RAF scrolls for specific details and examples of each. 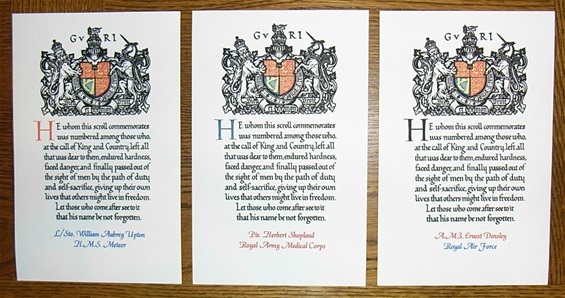 Left to right: reproduction Navy, Army and RAF Memorial Scrolls.